Repellent Insecticide with Pyrethrum for flying insects. Natural Defence Programme for automatic dispensers. For home and civil use. Inserted in the special Automatic Dispenser, the special dosing valve permits controlled release of about 50 mg at constant intervals so as to keep a room of about 150 cu.m, even if ventilated, free from insects without any risk for people. 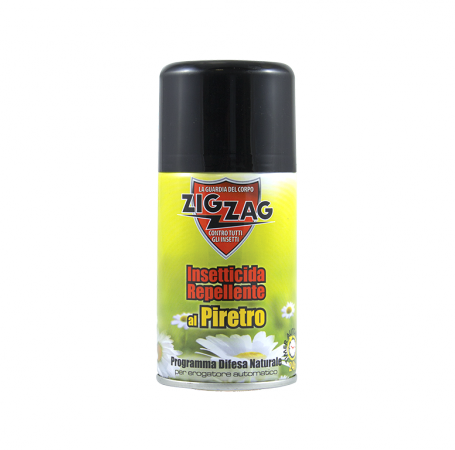 Notes: The can of Zig Zag Repellent Insecticide with Pyrethrum can be used with the most common automatic dispensers on the market. Automatic dispenser for air in room. Foods and containers for food. On flames or incandescent bodies. The products acts by contact and ingestion.